Everyday we are faced with the decision to take what the day brings and stay positive or to allow trials to destroy us. I’ve had my share of trials and I admit there are some days that are more than I handle…I cry, I pray…I cry some more…I move on. Not everyone can do that, not everyone has somewhere they can turn, someone or something to look to for help, for comfort…for peace. I’ve made it this far, not on my own, Glory be to God for the peace I’ve received in my times of need. I think I’ve been through some tough times, but today I was blessed to share in a special day, a day of victory, a day of overcoming that most would bow in defeat! 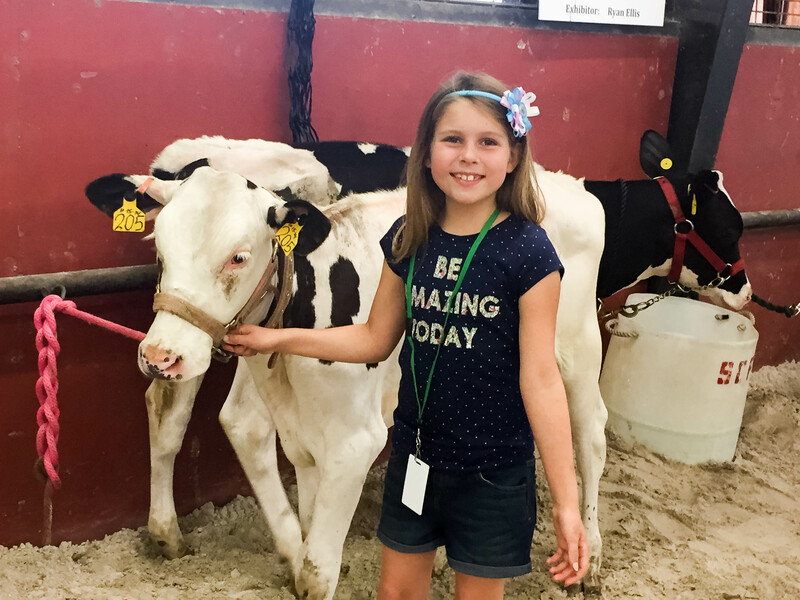 Today was the entry day for all kids competing at the Sarasota County Fair. I remember as a young girl, my friends and I were in the 4-H horse club. We made and sold elephant ears at the 4-H booth. We were allowed to stay the rest of the day after our shift and see all of our friends, but the best part was that I got to hang out with my best friends from the barn. It was a great time in my life, those friends, those moments carried me through some hard times in my life. Now, the county fair brings back memories of rides that made you sick and food that made you sicker! I guess as time passes and the further you walk away from who you were, time muddies the memories and they start to look less like anything you would want to remember. Today, the mud was cleared by the tears from a video of a rescued bunny and a little girl and her calf! Today, I was brought back to the one of the many reasons why the fair was one of my favorite places when I was younger. I was reminded why cows, pigs, chickens, bunnies, goats and ducks were more than just farm animals, they are valuable in connecting kids with the outside, teaching them a sense of pride and accomplishment and most of all, helping them bond with real friends that will last a lifetime! As I stood in the tent where the bunnies, roosters, ducks and chickens were, there stood an amazingly happy family. Todd and his beautiful wife Jessica were there with their two children, Bailey & Xavier. There were many families there today, all with children that were entering a furry friend into the fair to compete, but this family was different. This family not even 36 hours ago, lost every possession they owned and sadly 3 dogs in a house fire. They were renting and didn’t have rental insurance, so they lost everything! Todd & Jessica are both Veterans who fought for our country, they sacrificed their lives and now this amazing family of 4, have lost everything, but each other. Everything but…a miracle bunny named “Shadow” who was revived and rescued by the firefighters. Everything but…a hedgehog named “Sonic” that was found a day later, still alive! This family was smiling and giggling the entire time I was there. The strength that Todd and Jessica have… to keep it together for their children, when there is so much loss…they are inspiring others…they know that they have each other and that is the greatest blessing. The parents are trying to keep the kid’s spirits up and being around the animals, the community and their friends helps remind them that there is so much good to focus on! I wanted to meet the family, take some photos to help them create some new memories, give back to my Veteran brother & sister and in trying to help them heal, they helped me remember a time of my life that was missing that I’ve desperately needed back. Their daughter Bailey is showing a calf named “Snickerdoodle” today at 7 pm. She lost her show outfit in the fire along with her show boots and belt. I heard that someone had donated boots for her to wear today, but I would love to help Bailey have a beautiful shiny show belt to wear today…shiny like her smile, even in this terrible mess that their life has become overnight. I’m asking my Greenwood Stable friends, Hunt Club friends and friends that are still at barns, to donate to this family. We all know what it was like to show animals, we had our show clothes, our own jackets and boots, but what if we lost them in a fire? I can’t imagine how this little girl is feeling, how her little brother and her amazing parents, how they are coping. I CAN imagine that maybe giving her something to make her feel special, like a shiny new show belt, how that might make things good just for a day and I want to help give that to her! Her family has been given clothing for the kids and right now they are all staying at their parents house. I know it sounds silly to ask for just a belt when they need so much more than that. I believe that there are many people out there that want to help others, they want to really know who they are helping and they want to really connect. I wanted everyone to really know this family, not just see them as a family in need, this is more than a story of a bunny, a cow or a shiny belt. This is a family of Military Veterans, a 4-H family, a family in our very own community and they need your help. Will you please help? Next Post How did I get here and why did it take so long to find myself?! This is my beautiful family, thank you for sharing their story. They are truly over-comers and are blessed with an amazing community who have reached out to them.